Physician and researcher at the Icahn School of Medicine. Response: In this study, we report on an accurate asthma biomarker we have developed based on a simple nasal brush. Asthma is a chronic respiratory disease that affects 10% of children and adults in the U.S. Mild to moderate asthma can be difficult to diagnose because symptoms change over time and can be complicated by other respiratory conditions. Given the high prevalence of asthma, there is high potential impact of improved diagnostic tools on reducing morbidity and mortality from asthma. Current diagnostic tools for asthma, including spirometry and bronchoscopy, require specialized equipment and expertise to operate properly. Many individuals, particularly young children, have difficulty with pulmonary function testing because it requires, coordinated, forced breaths into a device. Spirometry results are unreliable when done with poor technique. Bronchoscopy is not practical for mild to moderate symptoms. For these reasons, asthma is often diagnosed and managed based on self-reporting of symptoms This can be unreliable, resulting in repeated doctor visits and even trips to the ER. Thus, a biomarker test for asthma that is easy to implement and interpret is highly desirable for the diagnosis and management of asthma. Response: This simple, inexpensive test is easy to collect in a doctor’s office and results are determined with basic follow-up data-analysis. The biomarker was identified using machine learning algorithms. 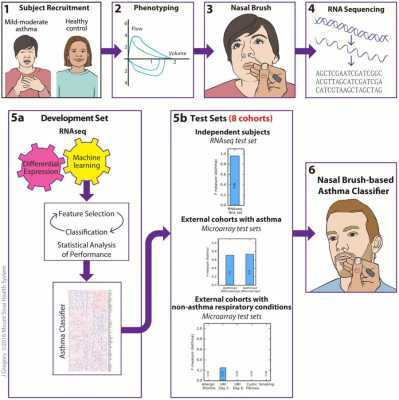 Response: A recommended future direction of the study is to recruit additional cohorts for nasal gene expression and profiling and extend validation of our findings in a prospective manner. Response: We’re hopeful that further studies can help bring this test into primary care settings, transforming the ease and accuracy of diagnosing asthma and our ability as doctors to appropriately treat our patients. This entry was posted in Asthma, Author Interviews, Biomarkers and tagged asthma, Biomarkers, medical research, technology by Marie Benz MD FAAD. Bookmark the permalink.